Alison Shaffer: Got a Dog? 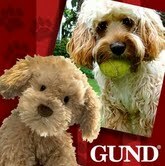 Enter GUND'S Contest and your dog might become a GUND! Got a Dog? 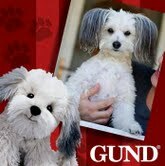 Enter GUND'S Contest and your dog might become a GUND! Do you have a cute dog, or maybe a not so cute dog? Head on over to GUND's Facebook page and submit a dog photo under the contest tab on their page. The Grand Prize is: GUND will create a limited edition model of the winner’s dog. The dog will be available in gift and toy stores in 2013. You dog could be a plush GUND! The contest is on now,so hurry up and enter today! Dates are July 16 - August 15, 2012, and the winners will be chosen the week of August 20th and announced the week of August 27th. Along with the “Top Dog” Contest on Facebook,GUND will run the “Most Pinteresting Dog” Contest on Pinterest. Post your entry on your Pinterest page and “tag” @GUNDMostPinterestingDog and submit the linkto GUND at MostPinterestingDog@GUND.com. The “Most Pinteresting Dog” Contest winner will be selected based on the number of times the entry is “liked” on the GUNDPinterest board and the winner will receive a selection of GUND products valued at $250 retail. Disclosure: Information provided by Child's Play Communication, the comments and views are my own. By sharing this information I will receive a plush GUND. What a fun sounding contest! Too bad we are a dogless household (allergies).